The Sandaig Islands have been on my kayaking bucket list for quite some time now. Situated at the southern end of the Kylerhea narrows and overlooking Skye and Glenelg, Sandaig is the setting for Gavin Maxwell's classic tale, "Ring of Bright Water", his story of living with otters on a secluded and remote corner of Wester Ross. Tania and I had a few days on Skye and and the conditions were looking perfect for a paddle from Kylerhea to Sandaig and back again.... 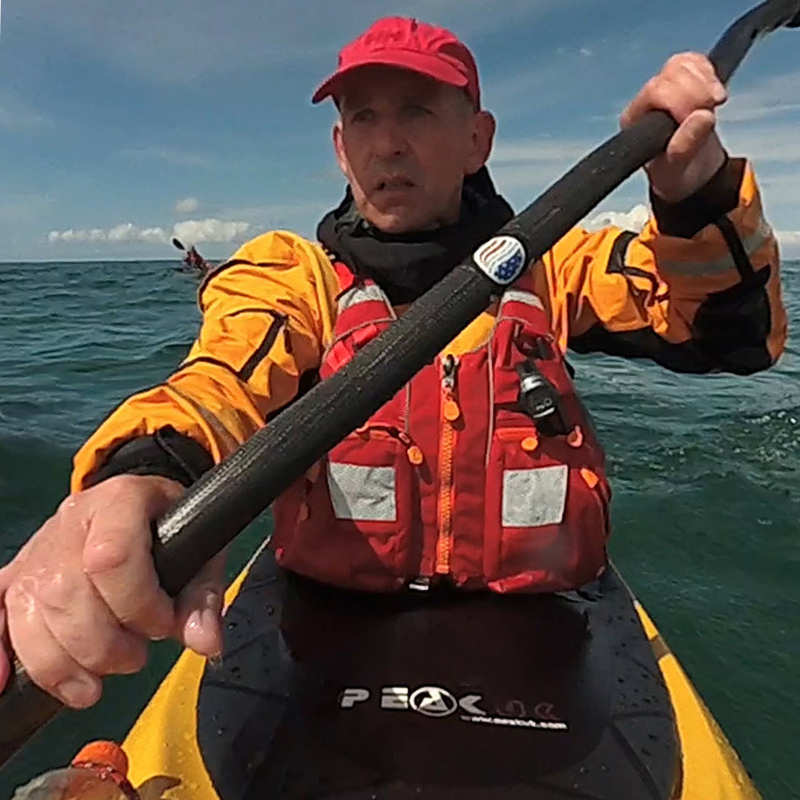 The forecast was settled, the tides were in our favour and we had the company of a couple of other paddlers - George from Greece and Roar from Norway. As we were on Spring tides, the flow in Kylerhea was up to its maximum and we were fortunate to have the advantage of the south-going stream on our way down to Sandaig. Running at up to 8 knots on spring tides, this is quite a useful conveyor belt. With a leisurely stop for lunch and time to explore the islands for a while, our plan was then to pick up the north-going stream which would assist us back up to Kylerhea once more. Launching from the ferry slipway at Kylerhea, we had clear blue skies, wall to wall sunshine, the tides in our favour and no wind. The conditions were definitely looking good. Launching from Kylerhea, we couldn't resist playing for a while in the tidal flow in the narrows. Out in the main channel and heading south towards Sandaig Islands, the GPS showed that we were making speeds of up to 7.5 knots (14km/hr), assisted by the tidal stream. Calm, clear water and a gentle paddle with Roar Laugerud through Kyerhea towards Sandaig. Click on the photograph above and a new window will open displaying the panorama as an interactive view. Having opened the panorama, use the controls to pan, zoom and navigate. As the channel widened, the flow slowed down and we gently paddled towards Sandaig. Approaching closer to Sandaig, we began to make out the features on the islands. The coral beach of Traigh a' Gurraban, where we were due to land started to appear in front of us. It's always difficult to resist the temptation to photograph kayaks on a sandy beach and this was no exception. Looking back up northwards from Traigh a' Gurraban towards Glenelg and Kylerhea. An opportunity for a panoramic view from the beach. Having explored the island, we lauched once more and paddled through the channels connecting the islands. Two views of Beinn Sgritheall from An Gurraban bay and crystal clear water. 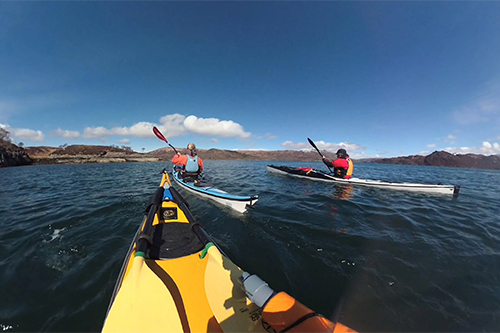 The Sandaig Island archipelago is small and it was an experience to gently paddle around the islands and skerries in such calm conditions, admiring the views. From the left, the view up towards Kylerhea, Sandaig light and Beinn Sgritheall, above Loch Hourn. Picking up the northgoing stream, we cruised back towards our destination at Kylerhea. Looking up the Kylerhea narrows from a low perspective. A selfie of the gang... George, Angus, Tania and Roar. 20km travelled and the map showing the route of our journey. If you have enjoyed this Blog post and would like to learn more about sea kayaking photography, then why not contact me for more details about my sea kayaking photography workshops.